On the weekend of October 8 - 9th, LPI Central Europe participated at Linux Days 2016 in Prague, Chechia. Linux Days (http://www.linuxdays.cz) is the largest Czech technical open-source and Linux conference, organized annually by a group of open source enthusiasts representing various major Linux distributions including Debian, Fedora, Gentoo and openSUSE. 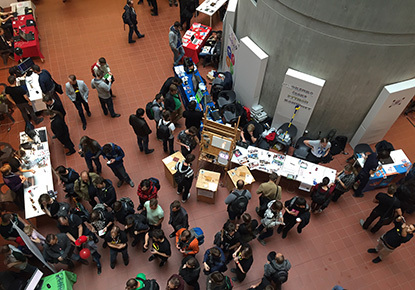 The event took place at the Faculty of Information Technology, Czech Technical University where nearly 1.000 people attended the event over the 2-day period. LPI representative, Elzbieta Godlewska, hosted an information booth in the main hall of the conference. Additionally, LPI exams were offered on the Saturday, at a reduced rate for attendees to allow the Czech Linux community to take the exam at a lower cost. LPI hosted a contest for attendees which included give-a-ways - 2 vouchers for the Linux Essentials exam, valued at 110 EUR each, and 3 Linux Essentials books in Czech. For more information about LPI in Czechia please contact Elzbieta Godlewska at elzbieta.godlewska@lpice.eu.